In 1877, [James Gordon Bennett, Jr., newspaper publishing heir] left New York for Europe after an incident that ended his engagement to socialite Caroline May. According to various accounts, he arrived late and drunk to a party at the May family mansion, then urinated into a fireplace (some say grand piano) in full view of his hosts. Attached please find two pictures of mining heiress Virginia Fair, whose father was one of San Francisco’s Big Four. 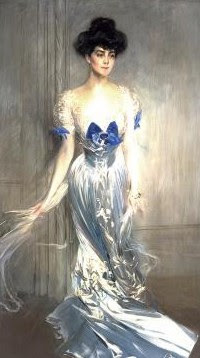 One of them is a portrait by Boldini. 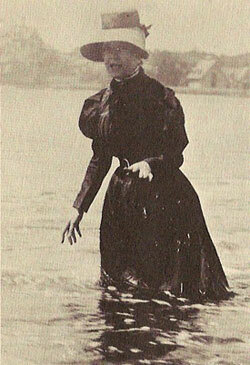 The other is a snapshot of her bathing at Baileys Beach in Newport, Rhode Island. I'll leave you to guess which is which, and which more accurately depicts the lady. 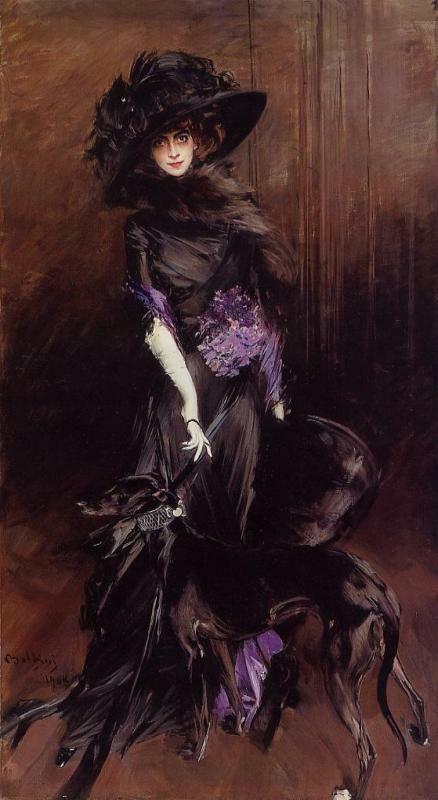 And, finally, another crazy rich person painted by Boldini: La Marchesa Luisa Casati, who apparently requested extra crazy. Bonus points for the inclusion of the greyhound, but menos puntos for wearing the dress that that one goth girl you know would have cut herself to wear to prom. Of course, we can only hope that we too will one day be wealthy enough to be so crazy. I had to go back and blink at that second painting several times before I saw the dog. Good lord. For real. It's a testament to the painting that it could be so eye-catching that you'd miss the whole other life form standing in front of the main one.